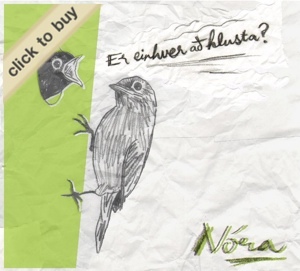 Nóra released their debut album, Er einhver að hlusta? (Is anyone listening?) and while l am listening, I am in a dream. Floating... Drifting into land of large fruit trees and lushish sprawling plains that end with mountains reaching into the sky scratching at the clouds as we drift. This is what you feel when listening to Nóra. These musical landscapes start sparse and gain more clarify as the songs progress. Well defined recordings with each instrument ringing out in its own defined space. If you are a fan of Stereo Lab or Belle and Sebastian; Give these guys from Iceland a listen and answer the question in the title, YES!